I should be working on content for my presentations at DevLearn in October that look at what's next in eLearning. (As a side note: if you are going to DevLearn and are reading this, please drop me a note.) However, the "what's next" question has become more challenging recently as we've seen the rapid growth of simple and easy to deploy tools displacing more complex systems. My last post, Direction of eLearning - Emergence or Big System, received a couple of interesting comments and I wanted to add a couple of follow-up thoughts. 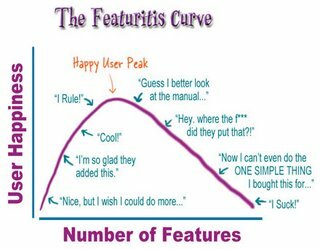 As the number of features increases our satisfaction level begins to go down because of the complexity of getting it to work for us. I believe we are poised to see this happen in the world of the Learning Management Systems (LMS). They are rapidly growing features that are far beyond what anyone needs. If you look at what's going on at Saba, SumTotal or any of the major players, they are adding features and major functional areas at an amazing pace. There are definitely some low-end LMS products that are easy to get up and going. But that's not really what's going to replace the LMS. They still require you to think and act in terms of "course" and "training" which is slowly becoming the wrong way to think. 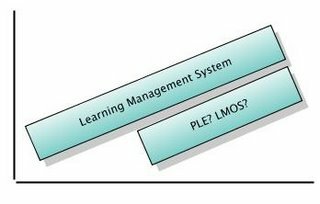 Of course, this raises the question - well if we don't really want an LMS, then what's the replacement? Scott Bradley Wilson helped by providing a post with more detailed visualization of this. I think that folks who are in the Personal Learning Environment (PLE) space have a much better idea of what will come next. In fact, many of us have all created our own Personal Learning Environment by cobbling together using a variety of tools (RSS Reader, Bookmarking, Social Networking, Desktop Search, Web Search, Personal Learning Blog, To Do Lists). I'm not 100% sure that we've quite got this right, but it's certainly much more meaningful to me as a learner than an LMS. If you step back and take the perspective of a learner, an LMS is simply one of many content sources and there is no advantage to me as a learner of having to go through and register for the course (except that I won't get bugged about not completing the course). The tracking is not for me as a learner. That's what makes me think that something more along the lines of a PLE will begin to come together to replace it. However, I remain skeptical that we really understand how to use these tools to be better learners and thus, are a bit away from having well-formed personal learning environments. In fact, I believe this to be one of the bigger questions that we face as an community. I am relatively new to the field of online learning. So I read your blog with interest on a daily basis, especially since I recently started my job for a corporate online learning department after spending a few years as a web developer (and thus have a big interest in Web 2.0 technologies). We have an LMS, and it's as controversial with our users as you might expect. So your recent postings about replacing the LMS with simpler, Web 2.0 technologies was interesting enough that I showed it around my department. But the answer that came back was this: We all know the users have mixed feelings at best about the LMS, but we are legally required to be able to show that our internal customers/clients, etc. have taken certain classes. And the best way to do that -- and the most acceptable to auditors -- is the LMS. Where does this fit into your vision of a future using distributed, Web 2.0 learning tools? Scott - First, let me commend you on reading blogs - that puts you in the top 5% of people in your field. Second, great question - truly! I'd like to continue to get your input on this topic. This is probably worth a full post, but let me start with a few thoughts. 1. In some cases it is mandatory to track training completion, e.g., compliance. This occurs often in certain industrys and content topics. If you are dealing with compliance, then *today* you still need the LMS. You mentioned "auditors" so I'm guessing compliance requirements. 2. In many cases internal clients say they need tracking, but its debatable. For example, rolling out a new product. They want to know who's gone through the training on the product. In all of these cases, if the LMS did a better job supporting the learner, it's a no-brainer to use the LMS, but the downside is that it's harder for learners to get to the content and makes the content mostly useless after training is completed. So, there's a trade-off between easy, on-going access and being able to track completion. The other part of the discussion is - What do you really care about? That they complete, or that they are able to do the work? I would say the gentle trend in corporate learning/performance is away from the LMS in these situations, but certainly it still happens a lot. 3. In the future - and likely some LMS products do this today - I just don't know them - we would expect that tracking will occur seamlessly. In other words, the user would be cookied and as they access content you keep track of this. We've done this already in many circumstances through customizing the LMS or by having a separate tracking mechanism - but it's painful enough that in most cases you are probably better off just forcing the user to use the LMS. 4. So the reality is - for now - that you don't replace the LMS with Web 2.0 technologies. Rather, you pick-and-choose when/where to use it. Once you open that up for discussion, then it becomes much more interesting to see what kind of solution results. Note: an LMS suggests a particular kind of solution. By the way, I'm curious what the "mixed feelings about the LMS" are? I have my guess at what you mean, but I'm curious. Thanks. I read blogs because I think it's a way to get unfiltered, personalized news and views. You can't always believe it all, but you can get good ideas and great debates. In terms of your response to my question, I see that. It's like any new technology, it doesn't answer all your questions right away, but pick and choose the spots where the new technology can actually make a difference for the better and you can see where it goes from there. Answering your question about the LMS, it seems like users aren't thrilled with the seeming lack of customization and being pushed into whatever design box the LMS creates. I worked for a small CMS comapny for a while, and it was the same issue there. Getting back to the overall question about Web 2.0 technologies and their overall acceptance here in the corporate world, the other issue I see here -- and remember, I am new -- is the big IT wall. We don't choose our technologies. We recommend them and IT makes the decision. We haven't even tried anything collaborative yet -- blogs, wikis, etc. -- but my guess is that security is going to be huge concern on their part. I know you have touched on this before in earlier posts, but do you have any thoughts about getting IT on our side with new, collaborative technologies? Scott - what do you think the security concern(s) will be? I've not found this to be much different than security concerns around an LMS. There's a twist because of the ability of many people to be authors, but since that's tracked by the Wiki, generally this passes scrutiny. By the way Scott, is your blog something that is aimed at an internal corporate audience as much as an external audience. In looking at it, seems like it is. Makes it an interesting blog for me to point out to folks. Let me know if that's okay. Sorry to take so long to answer your question about the public status of my blog. Obviously, it's on a public server. I did this because we do not have internal blogging technology -- and if we do it internally there's no way to have this kind of interaction. But after your initial question, I wanted to find out exactly how my employer felt about it, since I am doing it on company time -- with permission of my bosses. The answer: We're not sure. Right now, they agreed to let me keep it going for a month or so until they decide how they want to handle it. So... long answer to short question. Please do not link to it at this point. Once the status is more secure, I will let you know. Thanks. Which, of course, is a fascinating answer itself and indicative of one of the central concerns about these technologies. My sincere hope is that you would be able to continue to blog in public so that (a) you can be part of the dialog, and (b) so that you can continue learning. It's really as much of a self-directed learning tool as it is a communication tool. Let me know how it ends up. Unlike Scott, I'm not new to online learning; I headed mainframe CBT projects as long ago as 1980. I believe there is a role for the "course" metaphor, though more and more I think that's a role for relative newcomers to a cluster of knowledge and skills. In other words, if you come to work for Acme Widgets (or Widget Nonprofit Services), or if your job changes significantly (move from engineering to sales, shift from widget analysis to client support), the organization can plan and deliver effective, efficient ways to help you acquire, maintain, and increase your basic competence. Not necessarily how to use our kind of email (you probably know email already), but our custom processes, our market, our competition -- as these things affect you directly. Even this week, I've had conversations with clients that suggest to me how we're partway between two worlds. A senior exec at the client organization is gung-ho on "continuous learning," but the way he's pushing that is a series of subject-matter-based, online page-turners. The custom system (developed by an outside vendor) apparently has no way to segment learners or courses, and so the gatekeepers think all courses should be open to everyone -- including people outside the organization. My direct client wants to try a small, proof-of-concept course for a targeted audience, and has an uphill struggle. We have a kind-of-open infrastructure but a corporate-schoolhouse mentality. An LMS also carries the potential for what someone described as "feeding the elephant." If you are Mega Widget Corporation and you spend a lot of money creating a corporate university (or a learning environment -- what matters is not the name but the price tag), inevitably someone's going to want to amortize the cost by urging you to apply the structure even when it's not helpful. Ten or fifteen years ago, the person talking about "feeding the elephant" was having to fit learning into the satellite broadcast network her organization had flung itself into. Dave - I agree with you that there's a role for course and that it's most often for relative newcomers. Once people know enough about a subject, their knowledge is so scatter that you have to looks for common holes in the knowledge for other "courses." But the vast majority of needed learning will not be common across a large enough audience, so you look to other mechanisms. The issue of "feeding the elephant" is also a really good point. It is related to (but slightly different than) having a hammer and thus everything looks like it needs a whack. With an LMS, every learning need looks like a course. "Feeding the elephant" was such a striking phrase; I knew as soon as I heard it that I'd often worked as an elephant feeder. E.g., because of distance learning's obvious and easy-to-reap benefits (mainly, less time off the job and less expense for travel), a sort of skill/knowledge Gresham's Law kicks in. People want to capitalize on the efficient system (whatever it is) even for things at which the system is inefficient. That partly explains the fourteen thousand different applications that converted PowerPoint talk shops to web-based PowerPoint talk shops. What about the concept of a Learning map. A guide so to speak of what you need to learn and where to find it. That's a great point. The learning map is important and valuable - often it's obscured in an LMS. So maybe focusing on that instead would offer greater value proposition. Somehow this old post appeared in my Google Reader but I thought the post was thought provoking. I'm President of LatitudeLearning, www.LatitudeLearning.com, an LMS vendor. I agree with you that LMS users want a simple, intuitive interface. However, to most people this translates into having an LMS that can adapt to their learning processes. 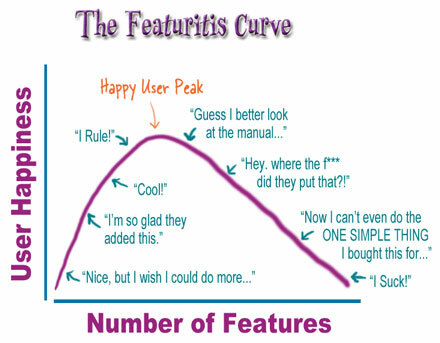 Likewise the handful of functions that one community needs, is not necessarily the features another community needs. That's why we've chosen to architect our LMS with embedded Content Management, Web Services, and Web 2.0 tools so each LMS portal can be easily adapted to a community's needs. However, I also agree with you that our understanding as learning professionals on how to use the LMS toolset is evolving. I personally think it will take another decade for a learning management solution to evolve to maturity. Tony, I seen your blog and like the idea of getting an impartial opinion on our current scenario. I'm in the process of implementing the Learn.com (LMS) (now Taleo) software and it's been an extremely painfaul process. I am the PM/ Analyst on the project and the more we peel back the layers on this onion, the more we find that the LMS we purchased does not do even the most basic LMS functions. My background, is 17 years in IT implementing many complex system and this one I think scares me the most, as we're seeing defects, changes to original agreements in the 11th hour and our team is very concerned that this product will not meet our communication and "messaging" needs and other critical needs such as tracking Assessment/ Course completion. We are considering pursuing other options; however I want to start viewing Blogs/Sites that show Customer Satisfaction with various Learning Management Systems. 1) First, are you familar with Learn.com (LMS) and do you know if customers are generally happy with this software? and 2) Second, do you know where I can go to see Company/ User evaluations of the various systems? Thank you. 1) First, are you familar with Learn.com (LMS) and do you know if customers are generally happy with this software? I am familiar with Learn.com although it was a little while ago the last time I dove in deeply. Like most LMS solutions reactions are mixed. I know a few very happy customers and some that have faced challenges with particular models that don't fit that well. In fairness, these models didn't fit well with any LMS. 2) Second, do you know where I can go to see Company/ User evaluations of the various systems? The last time I had access to that kind of information. I don't think user surveys are currently being done even though it should be. Does the discussion/debate do any good?